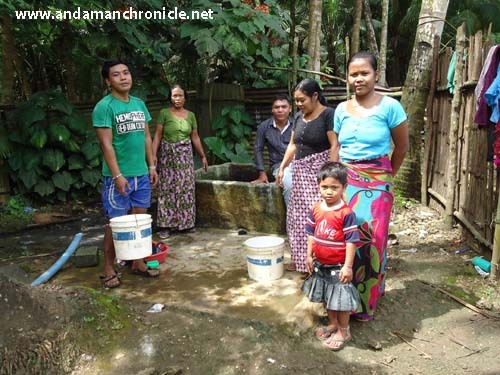 Car Nicobar, Aug. 2: Drinking water supply has been badly affected in Car Nicobar as there is no water supply for the past 10 days. Owing to the situation, the villagers are forced to use the contaminated water of wells for drinking and cooking purposes. A resident of the Tamaloo village and head of his ‘Tuhet’ of around 100 members Shri Alfred told that inspite of so many requests made by the captain to the authorities to provide drinking water through the mobile van, no action has been taken yet. He alleged that the van goes only to the selected villages. In the Tsunami shelters also the pipe lines are dried up as the water supply has been discontinued since many days. The people are bound to walk to many miles to reach to the nearest well for water. The water crises situation was exposed recently when the Member of Parliament, Shri Bishnu Pada Ray was on visit to Car Nicobar. During his visit to the villages the people explained their pathetic condition caused due to the non-availability of the drinking water. Anthony, a resident of the Tamaloo told the MP that every day they wait for the drinking water van to come to their locality, but their wait ends in despair. The Tsunami shelters are located at a hilly area where no water reservoir is available. Meanwhile the APWD Authorities have said that since their stock of Diesel has been exhausted, they are not able to operate the pump houses, causing the interruption in the supply of water. In Car Nicobar the ‘water crises’ has been looming large for years. There are two RO plants located at Head Quarter and Sawai village and every day there is a huge rush to collect water. The Member of Parliament on inspection found that the water from the so called RO plant is not potable as it lacks vital minerals. While testing, the TDS value was found to be around 6, which is much less than the defined level, the MP remarked. He said that the ‘Total Dissolved Solid’ value of the water of the branded companies, packaged in the bottles is around 16-17. This water will cause serious health problems, the MP cautioned. The story of the other villages like Malacca is also not different. The Joint Secretary of the local unit of Human Rights Organisation, Shri Mariappan has also alleged that the drivers of the water van take their vehicles to the captain’s residence only and the common people are deprived of it.